I am going to write several articles this week about the governor meeting. The video of the meeting will be up Monday or Tuesday. Just wanted to post so people know! King Blackthorn kicked things off requesting advice on how he should deal with the leadership situation in the Crux Ansata. After the recent disastrous expedition that saw more lives lost than any other in recent memory, he sought to replace Lady Wellings as a commander. The council could not come up with any good replacement for her. King Blackthorn thus decided to have Lord Dupre accompany Lady Wellings to offer advice and tactical counsel. However, this could lead to yet more tension and drama with the resentment directed towards Lord Dupre! Governor Cauchemar of Trinsic brought forth that their jails were overflowing with prisoners. He wanted to re-enact the age old tradition of cannibalism, unfortunately that has been outlawed by Lord British for many years now. Instead they are going to be transferred to the Prison in Yew. 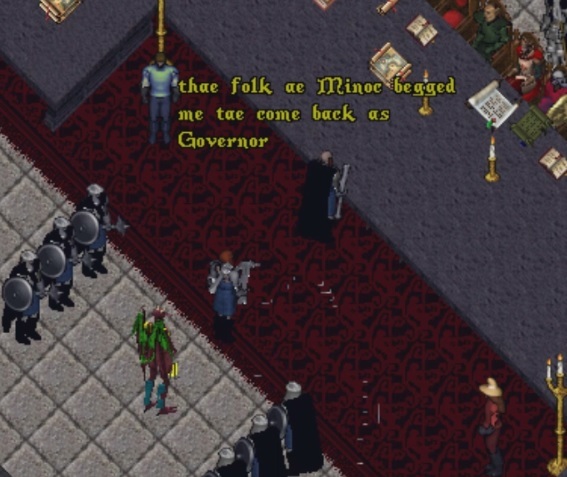 Governor Lavendar of Yew spoke of the upcoming prisoner transfer from Trinsic. There is also beginnings of a plan for a contest of archery to be held in August and a scavenger hunt in the fall. Governor Zynia of Vesper announced the success of a recent fishing contest. It went so well the plan is to repeat it in August! Governor Tatiana Thorn of Skara Brae said the city continues to prosper. She also it hosting a gathering each Monday evening at 9pm EST in New Haven to assist newer players. Governor Parfu of Britain seeks to hold an event involving crafters and fighting. It didn’t really make much sense. Maybe the translation didn’t come out right? Keep an eye out for more details. Governor Beldin Brightaxe of Minoc has regained his position in Minoc. Being a dwarf, it was also difficult to understand what he was saying. But that might have also been more of him not being able to see over the table. Next time he should bring a stool to stand on. Brightaxe says the previous governor was not looking after the city. He also found a Chaos Banner inside the governor’s house. We look forward to what he can do for the city of Minoc. 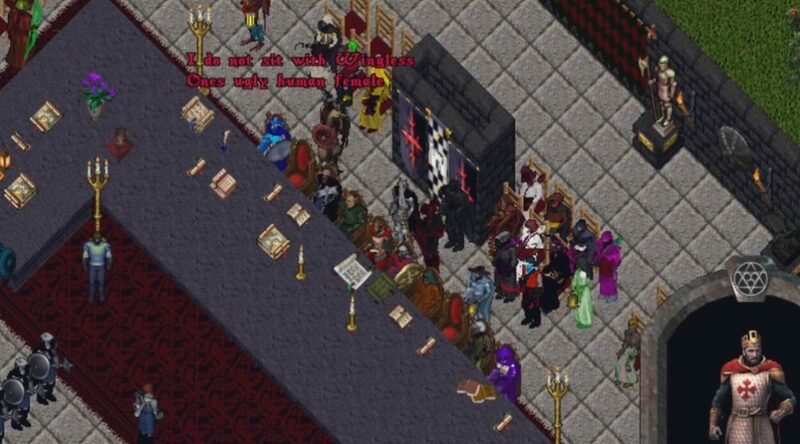 Governor Draxsom Pri-Lem of New Magincia has become the first elected Gargoyle governor in the history of Britannia! There was a lot of suspicion of his motives. He spoke of “taking over a city” and “launching invasions”. Once again, this may have been an issues with the translator. Or was it? Governor Angelica of Jhelom says trade has been booming for the city, despite disturbances in the waters around the island. There was also an issue with the Bulls, but lets keep this report family friendly. Governor JC the Builder of Moonglow started off with pleasant greetings to his fellow governors. But everyone knew that it would not last long. He immediately launched into an extensive statement about his concerns for the kingdom. The reaction of the crowd and governors was divided. A more in-depth review of the speech will be reported on later this week! We’ll have to see how this new racially diverse and divided makeup of governors will lead during the next 6 months. Keep checking back for plenty of reports on this and more. What a fun night in dungeon Deciet the other day! Once again, a whole lot of players rushed head-first into Felucca, trying their best to make it out alive with good loot. 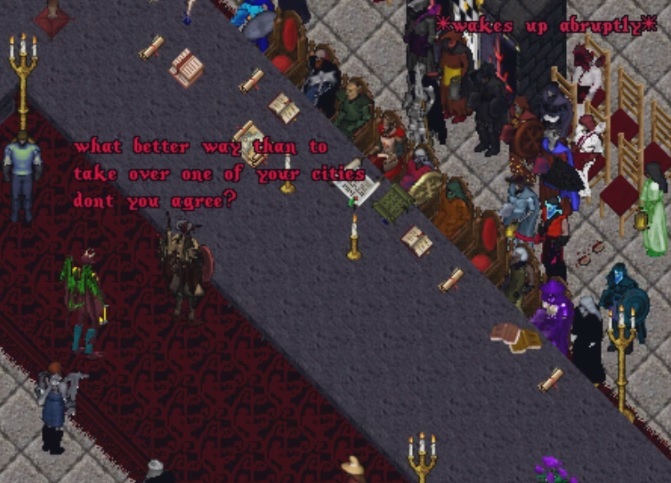 With the changes since the event last month in Hythloth it was more fun! 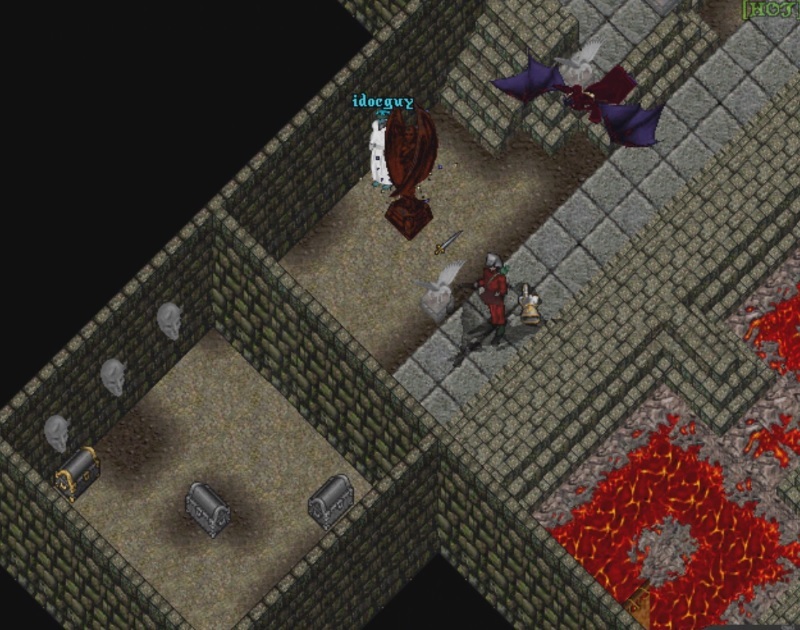 Way back in the day, dungeon Deciet used to be one of the top spots for hunting monsters. Naturally it also became a hotspot for player killing as well. I personally haven’t spent so much time on the bottom floor of Deciet in what must be 15 years now. 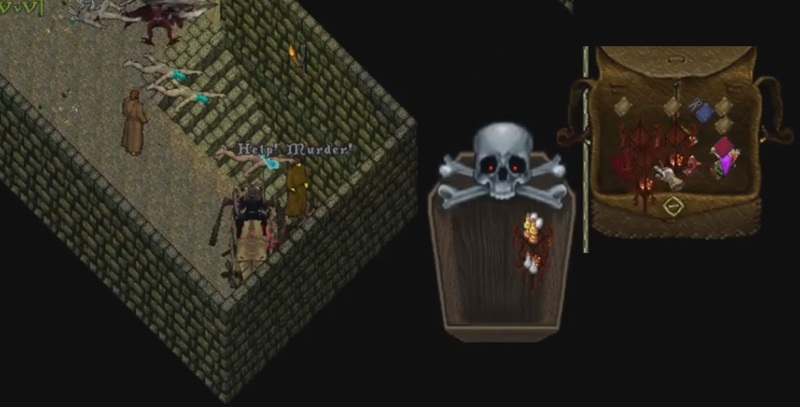 It was very nostalgic running around the Lich Lord room, the hidden passageway in the lava room, seeing that room with the 3 stone faces where I used to spend a lot of time killing Liches. HOT Guild did very well during the event. I personally stole 3 of the gargoyle statues (which you can see if you watch the event video). It was very harrowing trying to avoid all the thieves and other people trying to kill you. One big and unfortunate thing about the event was the entrance to the Primeval Lich area did not get blocked off. While I ran all the way out through the front of dungeon (which is what was intended) most of the rare statues were brought out through the Stygian Abyss area. Our guild swept the entire dungeon and there was literally no one left, they all exited through there. But it can only get better from here! Event Moderator Bennu certainly made things more fun this go around. The safer starting area, information on what we will be doing, and less overpowered monsters made the focus much more on stealing and PVP this time. Please encourage him to do it again, and soon! 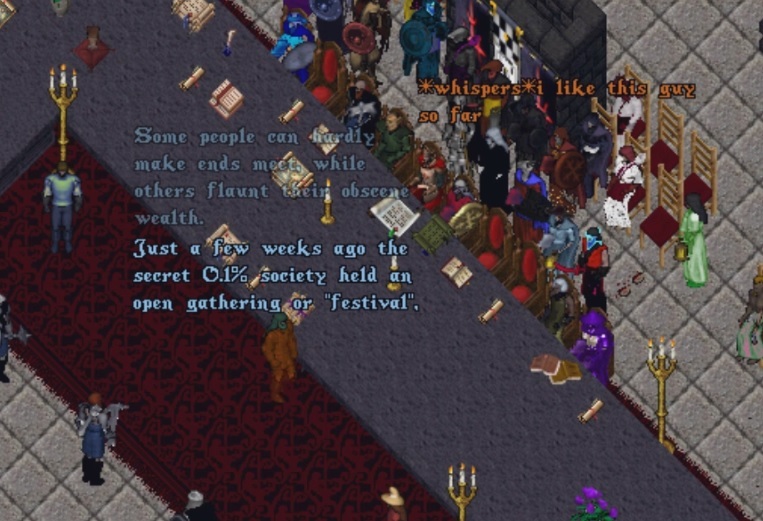 Finally, I spent a lot of extra time adding notes in the video so people who may not be familiar with Ultima Online can follow along more easily. I also used several of the Midas parody songs to give it more impact. Please share it far and wide to help promote the game. We have seen a lot of people coming back to play recently after they learned the game is not dead yet! This Thursday, June 23 at 8pm EST will be another Felucca based EM event where PVP is encouraged! There was one last month and it had a big turnout. 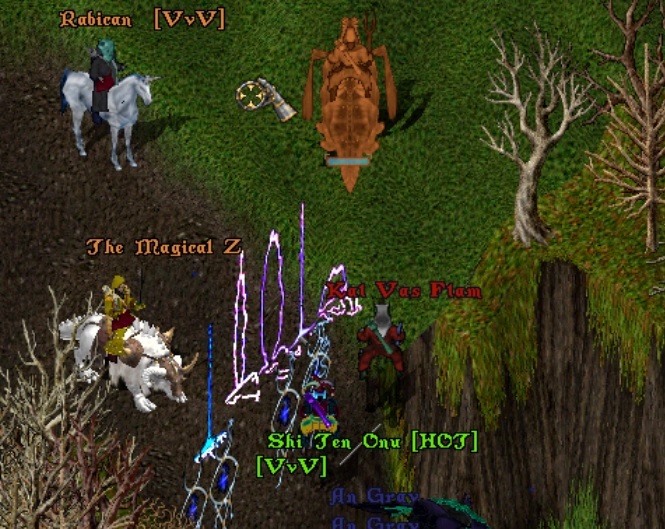 Lots of players stealing, fighting, killing and all kinds of fun. Event Moderator Bennu says it is going to be similar as last time, but with improvements. This means the rare items first have to be stolen off the ground using the Stealing skill. Once stolen, the items are cursed so they can not be insured. This also means if you kill someone carrying the rare item you can take it for yourself! At the last event I lucked out and found a corpse with 5 lanterns on it! Shortly after the event I recorded a podcast with Zarcon (a HOT Guild Council Member) to go over what we thought of how it went. You can either download the MP3 or listen on Youtube. Eventually it should get on iTunes and you can subscribe and listen that way. Future podcasts will include topics such as PVP, Vice vs Virtue, IDOCs, how I am roleplaying being the Governor of Moonglow, and more. Speaking of being the Governor of Moonglow, I will have another post up later this week about that. The monthly governor meeting is this Sunday. I will have information about how to get Moonglow titles, what policies I will be working on, when my office hours will be, etc. 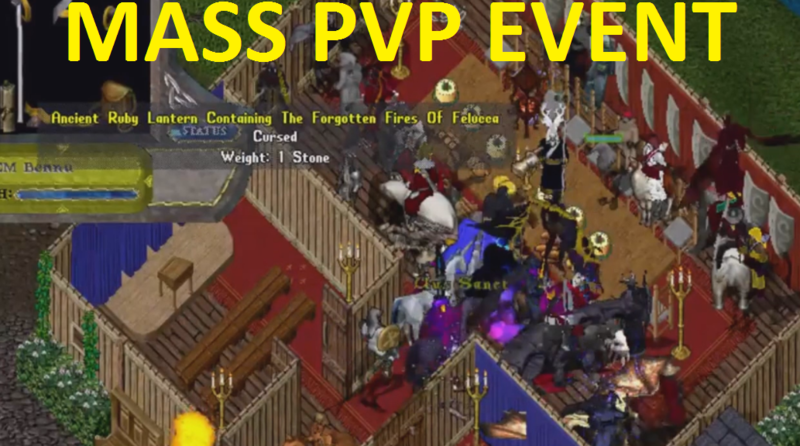 For now, I hope to see you at the EM PVP Event this Thursday, HOT Guild will be out in force. But even if you are alone you have the chance to come out on top. One solo guy made off with 9 lanterns last month!